The world's smallest car measures just 45.2 cm tall. Mirai, which means "future" in Japanese, has just entered the Guinness World Records for being the lowest roadworthy car. 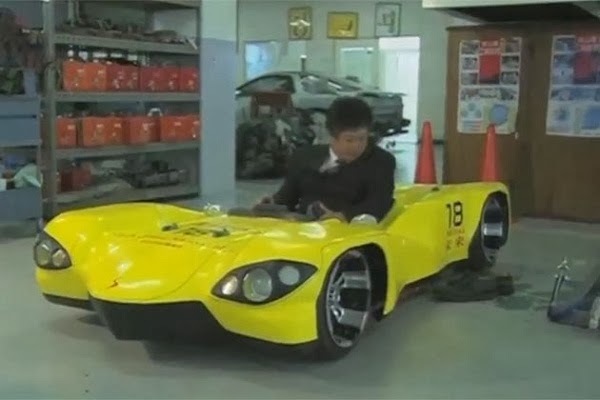 It was created by students and teachers of the automobile engineering course of Okayama Sanyo High School in Asakuchi, Japan. It runs on six main batteries. The motors and controlling components are from "Q-car", produced by CQ motors in Japan, while the switching console is from a motorbike. The chassis, body, suspension, steering system, lights, seat and all other parts were made at the high school. The record for the lowest car has been held in the past by British motor fanatic Andy Saunders, from Poole, Dorset, when he built a 21 inch (53 cm) version using a rusty 1989 Fiat 126.